After my apple dessert loving husband recently taste tested six common apple varieties found in Australian fruit shops and supermarkets, we decided to subject apples purchased from the Melbourne Slow Food Farmers Market to the same rigorous workout in an effort to identify the variety he likes best for apple pie. The Farmers Market apples, bought from three different growers were all $6 per kilo, quite a bit more than the $3 and $4 per kilo price I had paid at my local fruiterer. We bought nine different varieties. All were certified that they were grown organically and three had been grown in a permaculture enviroment. As with the first test, I peeled and cored each apple and cut it into eighths. Each was cooked with 2 tablespoons of water for a maximum of 10 minutes. No sugar or spice was added to the samples. Mal tasted the raw apple as I prepared them, curious to see if their flavour characteristics would be altered by cooking. His favourite, both fresh and cooked was the Andre Sauvage, a small unassuming russet coloured apple with a roughly textured skin. The apple softened quickly during cooking but did not become puree like most of the others. I was put off by it’s grainy texture, but the robust sweet fruit flavour made it a winner. 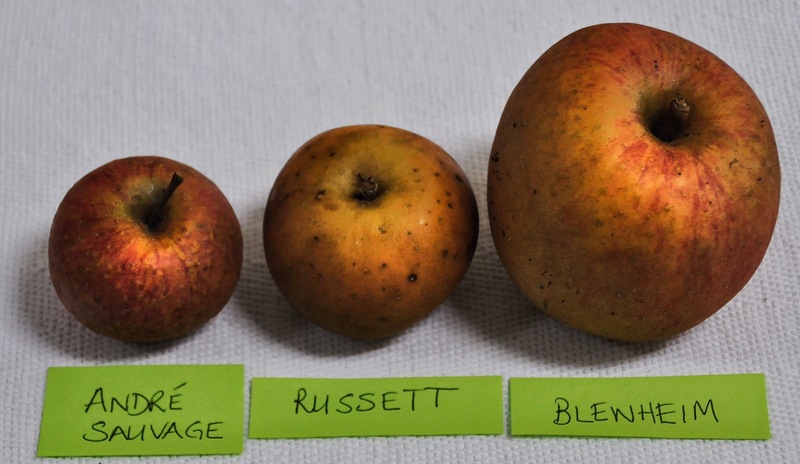 Like the other russet coloured apples Andre Sauvage had a beautiful golden colour when cooked. The juicy fleshed Mackintosh came a very close second. The flavour delivered a hint of butterscotch an interesting consistency because I’d noted as I’d cut them that the texture of the raw apple was buttery. The cooked apple reduced to puree and looked dry but it was juicy on the palate with fresh citrus notes. Blenheim, another russet skinned variety had a delicious sherbet zing on the aftertaste which I found very appealing, but it lacked the sweetness that Mal likes in an apple, so it’s a candidate that needs sugar added. Royal Gala was the only apple I cooked in this round which held it’s structure, and while it was sweet and juicy with a creamy texture, it lacked acidic tang and robust flavour. Splendour was an interesting apple. The skin was rough and blemished, but the flesh was flawless, a lively creamy green colour with smooth buttery texture. We concluded that Splendour along with Royal Gala was best eaten fresh. I had high hopes for both the Stewart’s Seedling and Bramley apples. Along with Gravenstein, they are heritage varieties I remember my Mum choosing to cook. The Bramley was enjoyable fresh but was disappointing cooked. It oxidised rapidly after being cut then lost all it’s structure in the saucepan. The wet puree had an off-putting musty flavour. The grower had cautioned us that the Stewart’s Seedling was just for cooking. It disintegrated in the pan to a dry puree with no distinctive characteristics . 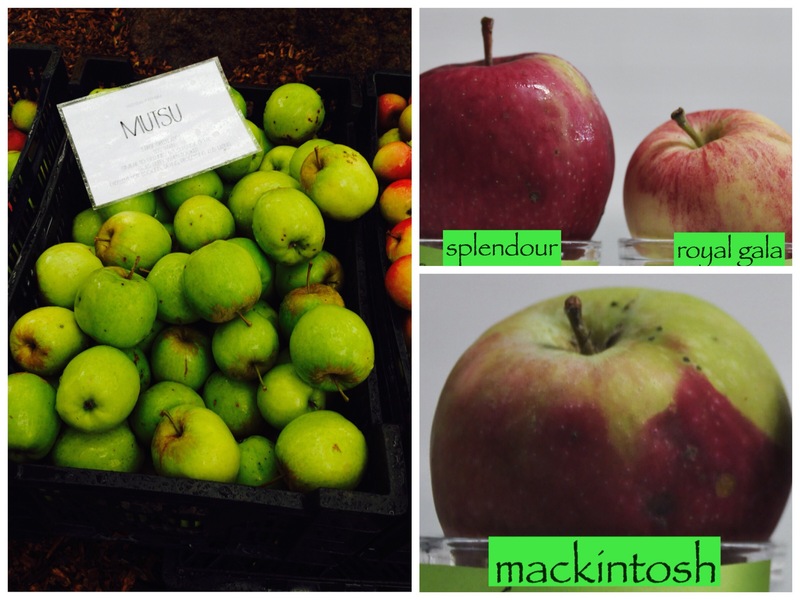 The two remaining varieties Muisu and Russett were mild flavoured and generally lacking in fruity apple freshness. Mal noted that the flavour was flat. After the taste tests were complete, I combined the Muisu, Russett, Bramley, Splendour and Stewart Seedling samples, added a little sugar, a squeeze of lemon juice, some cinnamon and a handful of sultanas. I topped it with a generic crumble and served it to Mal for dessert. After all the apple tasting that day I thought his response would be lacklustre, but in fact, he said the taste was exactly what he had been looking for all along! I think, in the end that all I can conclude is that THE best apple pie is made with more than one variety of apple. Next season, I’m sending my weirdo ancient apples to you for further testing. Old varieties are making a big comeback amongst the smaller growers here. I was amazed at the range of flavours an apple can have. Such an interesting end to this experiment Sandra! Rather exciting to know that the mixture of apples created the best flavour. 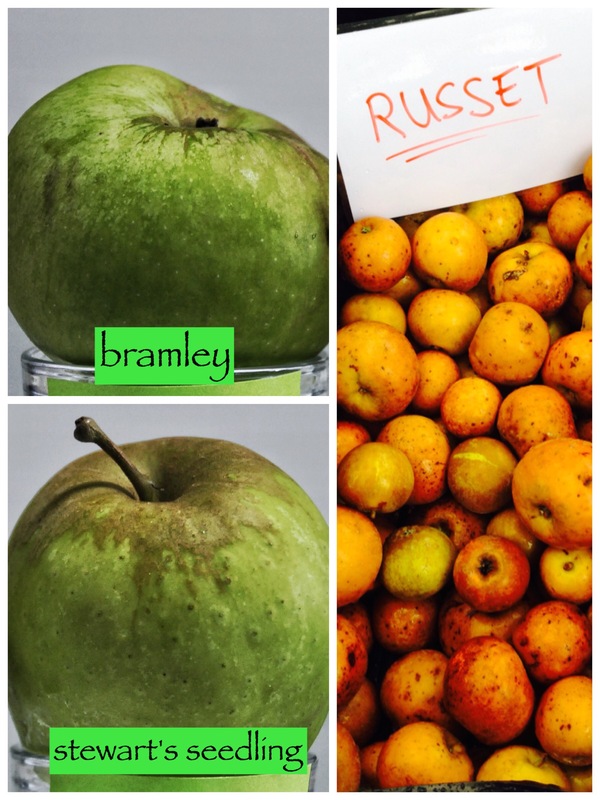 Surprised that the Bramley wasn’t so good… I’d heard that it’s one of the preferred apples for cooking in the UK. So many different varieties that I haven’t heard of before too – great that they’re making a comeback! It was a bit ironic that the mixed rejects created the best overall flavour. We also concluded that I prefer tart apples, Mal prefers sweet so we need a balance. I’ll keep trying new varieties as they appear as I learned far more than I expected. It was a very interesting exercise Glenda, I learned a lot about apples and my other half…. Beautiful post! I didn’t know many of these variety of apples, as we don’t have them in Italy… Very interesting! I’m sure you have many apple varieties never seen in Australia Serena. There has been a huge resurgence in interest in old varieties here so it was with great curiosity we tasted them side by side. Each variety had its own distinct textures flavour. Great foodie experiment and conclusion Mrs Recipe. I have sometimes used two varieties but only because I didn’t have enough of one. Love the idea of combining a few. Super. This entry was posted on April 28, 2015 by ladyredspecs in Baking, Desserts, Food, Fruit Desserts, Soapbox, Warm Puddings and tagged apple, apple taste testing.